Your door is a central part of your security; a weak and flimsy door can be kicked in very easily, whereas a reinforced steel door can mean added security for your business or home. To ensure you have the right door and have it installed properly, you want to consider the right door service installation. This means choosing door security that works well with your building and that works with your security system overall. 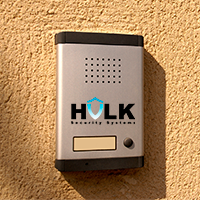 Hulk Security System does this best. As an example, you may want a heavy front or back door for your home for security, but a thick metal door is rather unsightly. The right wood can often be just as secure as metal, so choosing thick oak or maple can mean an attractive door that is also secure. You also need to think of the right door service installation in other areas of your home or business, not just front and back entrances. Garage doors are a favorite entry point for thieves since they're often neglected and not even locked. Doors from the garage can also be flimsy without strong, high-quality New York locks. For businesses, you want the best door service installation for warehouse and production areas and for front and back entrances as well. Glass doors can be inviting but they should also be secured with the best locking mechanism. Trying to put all these factors together when it comes to door security service installation on your own can be a mistake as can be doing your own installation, so call a professional and get the job done right.